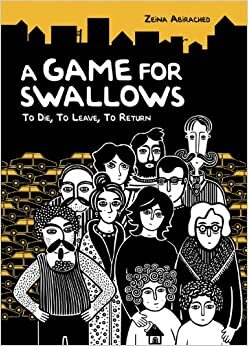 Zeina Abirached's graphic novel A Game for Swallows: To Die, to Leave, to Return is one of the most beautifully illustrated books I've seen. The drawings are in black and white, but the style and personality that come through is so strong and evocative. You can tell on the cover itself - the hairstyles, the faces, all of the characters are so distinct. The book takes place one evening in Beirut. Zeina's parents went to visit her grandmother and telephoned to say that they are on their way home, but it's been hours and they have not yet returned. So all of the other residents of the apartment block come to spend time with Zeina and her brother. Zeina tells their stories in asides and flashbacks. By the end, readers have seen several personal stories about life in Lebanon during the civil war. I enjoyed this book, but I found it a little difficult to follow the story line. I was often confused by whether we were in a flashback or the present day, and I didn't always know who the narrator was, since different characters would tell either their stories or other people's stories. And I didn't fully understand all of the context. For example, Abirached describes how her family went from using the entirety of their apartment to slowly using only one room, but I didn't quite know why their lives had become so constricted. And I didn't understand why snipers would be on every street trying to shoot all these civilians instead of fighting other soldiers. I have been lucky in never living in a war zone, so I didn't always understand the whys or hows behind what Abirached was saying. But the main takeaway, that war made everything difficult and changed people's lives so completely, was easy to understand. 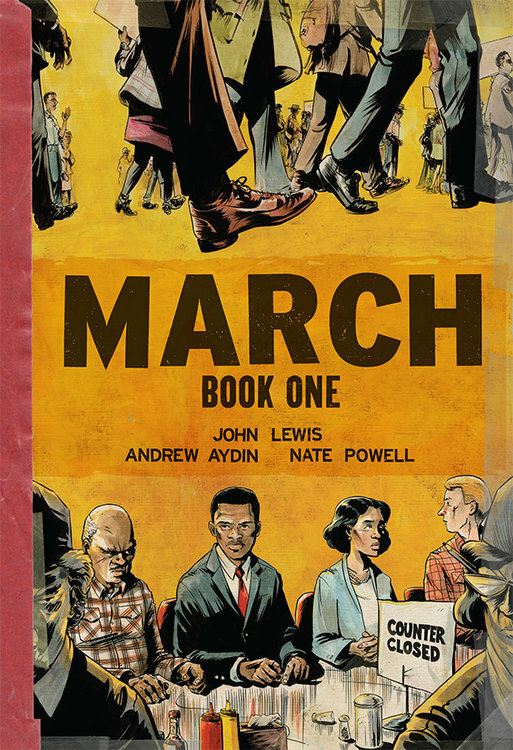 The first two volumes of March, by John Lewis, Andrew Aydin and Nate Powell, relate John Lewis' childhood and college years working for the civil rights movement. John Lewis is one of the "Big Six" civil rights leaders in American history; he spoke in Washington with Martin Luther King, Jr. and is now a US senator. It is timely that these graphic novels about the struggle to end Jim Crow and obtain equal rights and voting privileges for African-Americans came out recently, as it becomes more and more clear that Blacks are still fighting for so many rights. I really enjoy this series and hope that it continues. 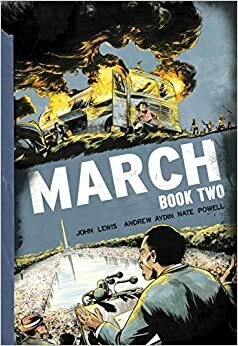 I liked the second volume more than the first one, but I think that's because it focused a lot on the freedom riders and the lunch counter protests vs the first volume, which had more to do with setting up John Lewis as a character. Hopefully, by writing his memoirs in a graphic novel format, John Lewis will reach a new set of American readers who don't always read memoirs or history books. I'm of the opinion that, for important topics such as this one, it's vital to tell the history in as many ways as possible, to reach as many people as possible. I've read a bit about the civil rights movement in recent years, but I really appreciate getting multiple perspectives and visions to bring the period to life for me. These books show just how terrifying it was to be a civil rights leader - they must all have lived in near-constant fear for their lives, and still they went out every day to make a better world. For some reason, a memoir written in graphic novel format feels so much more personal and intimate to me than one written in only prose. I'm not sure why, but I feel like I know John Lewis much better now for having seen his actions brought to life in vivid artwork. Highly recommend this read to anyone who wants to better understand the American civil rights movement. I need to place a hold on A Game of Swallows -- my library has it, but I always forget until I'm there that it's at a different branch than the one I go to. I'll try to hang with the time shifts. That's something I think traditional novels tend to do better than comics -- maybe? The art for A Game of Swallows looks gorgeous. March has been recommended to me, and I would like to pick it up some day. Right now, I'm in the second of Taylor Branch's America in the Kings trilogy, really good, immersive stuff, and after I finish with that body of work, I think I'll have a fantastic foundation for additional civil rights reading. It's interesting, I'd never heard the reference to the "Big Six" before, and had to look up to see who was meant, since there were so many amazing activists doing work at that time. I adored A Game for Swallows. It was the first book I read this year and it was a great book to pick for it! Started the year off on the right foot!